Side detail from the previous post! Detail of the micro blade/ powder fill brow from the previous post. The smallest adjustments can have such a dramatic impact! Microstroke training with Daria Chuprys! Last weekend I attended advanced training in micro blade technique with Daria Chuprys! I am SO glad I went and am very excited to apply all of my learnings in the studio going forward. I personally believe that the best results for most people come from a combination of hair strokes (micro blade) and a powder fill. This photo is of a 100% hair stroke brow. I will post some combo photos in the next posts for comparison. Side view detail of the microblade/ poder fill combo brow in the previous post! Front view of a microblade and powder fill combo brow. This client had a fair amount of naturally occurring hair to work with so it wasn't necessary to do a complete powder fill prior to adding hair strokes. She really wanted to even out her naturally occurring asymmetry. I'm excited to see how these heal! Of utmost importance in the process of microblade or any other brow service is designing and marking out the brows to insure they are even. This can actually take longer than the service itself! On my About Me page I share that I had always had massively uneven brows, so much so that I had to avoid certain styles of sunglasses because one brow would peek out above the glasses but not the other! Once I had my brows done I no longer had this problem and I am so glad I am able to help others who have significant brow asymmetry. Some schools of permanent makeup theory say that you should freehand the design of the brow to work with the natural shape. I am more than happy to accommodate that request but please know that if you would like to even out your brow shape I will take all the time we need to make sure they are as even as possible. 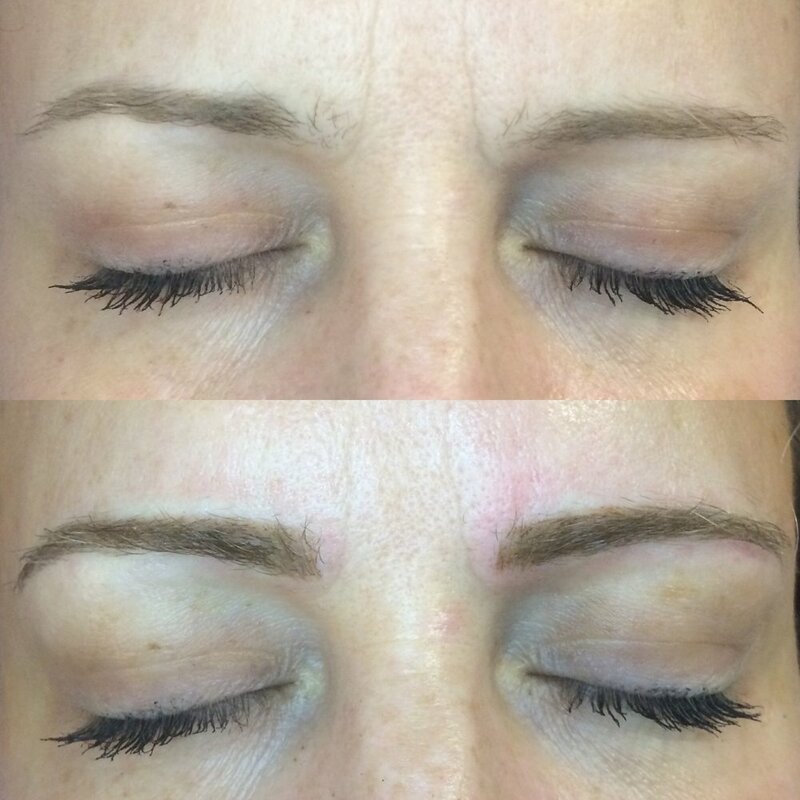 This photo shows the progression from the client's own makeup to her brows with no makeup, to right after the procedure. In the "Baby Blues" post you can see the clients healed brows after one session. This is a powder filled brow. We will be adding hair strokes to add dimension in her second appointment. For very pale blondes with little naturally visible hair it is important to add a background to the brow for a polished look. Baby Blues with Beautiful Powder Filled Brows! Here is a photo I was just sent by a client who wanted to re-create her day-to-day makeup look so went for a powder fill. She is very particular since she is a makeup artist herself so I am beyond thrilled with how happy she is with her new brows! I will post a before and after of her with no makeup but suffice to say this will be saving her a lot of time in her day-to-day routine! This is the healed result after two sessions. This is a selfie I got the other day from my client with the very sharp arches (sorry about the fuzzy picture quality!). She is most of the way through the healing process in this picture. As you can see the color has softened quite a bit and the brows are still in the process of exfoliating. The initial healing process takes about 10 days, during which time you must avoid pools, saunas, and hot tubs, major sun exposure, facials, and wearing makeup.